View a gallery of images portraying Felixstowe Ferry by local artist Jim Nind. On display within the Ferryboat Inn's new Garden Room. 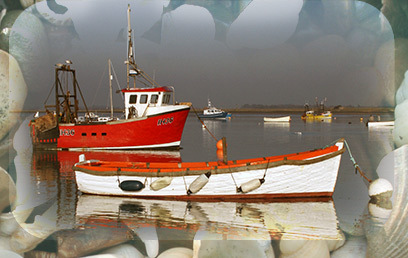 Felixstowe Ferry has been in existence since early times, some of the first recorded buildings dating back to 1043, when there was a fisherman's hut for selling fish on or near the site of the existing Ferry Boat inn. The Ferry guards the entrance to the River Deben which has been used for trading for many centuries and is the route that leads to Kings Fleet which is the area of the Deben where King Henry moored his fleet of war ships. It is also has access to Ramsholt, Waldringfield and Woodbridge. Grain and foodstuff was one of the main source of trade which was carried from Ramsholt to London. There was also quite a trade in straw which was used to feed horses in London up to the turn of the last century. Felixstowe Ferry was originally named Felixstowe - what is now Felixstowe was known as the Waltons. It was not until the early part of the 19th century that the names were changed. The Martello tower dates back to Napoleon times when it was used as with 74 others to defend this area, all 74 being dotted along the east coast. Today there are only 26 left. There are some very good walks that start at the Ferry and use the Sea Walls giving excellent views over the River, saltings, farmland and of course the Sea and Golf Course. The Golf Club which is situated on the edge of Felixstowe is one of the oldest in the Country, and guards the road leading to the Ferry which winds it's way through the links.